I was invited by JurasicPark89 to create an Illustration for the wargame "The 9th Age" with an illustration depicting a dwarf culture that would come from an area equivalent to Ethiopia. I absolutely LOVE this! 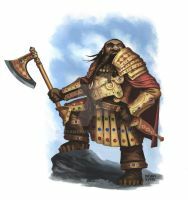 I'm a huge fan of Dwarves, and it makes me sad that spite their "popularity"(being present in most Fantasy Settings) they're always kind of a niche race, one that just exists. I mean, there are so many different subraces and subcultures of elfs in those worlds: High Elfs, Wood Elfs, Deep/Dark Elfs, Sea Elfs, Mist Elfs, the list goes on what feels like infinitely. And then there are Dwarves. They're just Dwarves. Maybe, if they're fancy, different Clans, but that's about it. I'm so happy that there are people out there who see that in a similar way. Your Design is great. Only thing is, I think they would have a little darker complexion than their further north living kin, just because they get a bit more sun. So they're still more pale-faced than the local Humans, but having a little bit of a suntan. If you meant it that way, I'm sorry, that I misunderstood it. Anyway, this is just gorgous. Again, great work. We absolutely agree on that, and I am doing my best to expand that unexplored niche. I meant him to be quite dark, for an underground dweller. Nice thought process; another reason why ‘African’ dwarves wouldn’t necessarily be black is that dwarves tend to spend most of their lives underground and the reason humans evolved black skin in Africa and white skin in Europe is to deal with the different levels of UV concentration from sunlight, something a subterranean species wouldn’t need to do. Thanks my friend. This is a good point. I absolutely LOVE it when people draw inspiration from non-European cultures for fantasy peoples, especially dwarfs, who are otherwise all depicted the same! I am of the same mind. So much to explore, and people keep pressing the same button. And i for one am glad you are! Keep up the good work! On a more serious note, please allow me to say that this is absolutely Lovely - two great looks that work beautifully together! Thank you very much for your kind words my friend. Thank You for producing such excellent Art! I say I say I say, if this is an Ethiopian Dwarf then does that mean he must come from Gondar? (If he does then we might have to keep quiet about it, the Tolkien Estate can be very sensitive). Especially not around Lawyers from the Tolkien Estate! I am pleased you enjoyed it. Cheers. Nice artwork! As a Warhammer fan I find it interesting to read your angle on this art juxtaposed against the faction it is ultimately related to. I appreciate that. Thanks you! where can I put a 'like' sign? Beautiful indeed! Well thought-out and executed. He oozes Dwarfishness, while the tie-ins with local (East) African details are clear and cleverly chosen. The cut diamond shaped shield is a particularly clever take. I am humbled and joyful that you picked up on the idea. Thank you very much! It is possible that I might attempt some Ethiopian Dwarf sculpts in the far future, for casting. May I borrow design elements from your concept artwork when and if that time comes? You would obviously be notified during sculpting or at release, and be given visible credit for your concept artwork inspiring parts of models, and you would probably also be offered freebies (amount of such dependent on finances at the future time). Also, I've got two modes of thinking about fantasy. The first is more seriously pondering, and my thoughts on both Dwarven and Elven physiology and Dwarven cultural constancy compared to changeable Mankind run very much along your own lines, and my take on Dwarven styles are in this mode much more about doing something distinctly (angularly) Dwarven than mimicking real world styles. But then there's also the more childish mode, where it's just plain fun to turn something from the real world into a Dwarf. Given that my own Ethiopian Dwarf doodles were done on the quick in the latter mode, it's fantastic to see you pursue something familiar to the more serious mode, though obviously executed much more skillfully and imaginatively (and more well-researched) than I could ever have done myself. Again, thanks a lot. Be well! I am delighted to see that you appreciated my entry to the project. I am glad to be able to offer something and I am very interested to see where the project is going. You can use the design as an inspiration for the miniatures, for sure. I would be most excited to get some miniatures in return of course . I understand your different angles of approach, and both have their own importance and place. Even if we talk about Warhammer alone, they have used a lot of the more "comical" and "absurd" approach through their history, specially in the early days, when that kind of playful almost cartoonish tone was so overwhelmingly present in fantasy and in popular culture in general (largely in the 80s and a bit on the first half of the 90s). I didint want to sound like I despise it or that I consider my approach superior in any sense, I just wanted to explain where I was coming from and the motivations behind my design. That said, I think your designs are quite good and very entertaining, you accomplished a very effective design within the approach you chose. More diversity of approaches means more people pleased, and I am a strong backer of diverse artwork. Thanks again for your compliments and for this opportunity. Cheers! Not derisive at all, no worries. I always enjoy your art and thoughts. Dwarf treasure hoard. Keep up the good work! This is great! I am happy to hear that. Great work on the beard, the most important part of any dwarf. Also I love fantasy civilisation art and lore so I'm pretty happy I found your work. anything special you're working on at the moment? Yes, a few projects. The most exciting one is a partnership with Mr. Turner Mohan, but I cannot disclose more at the moment. You will hear from us soon though.